Shoulder to shoulder with male fighters stand both Ra’afa Abdullah and Riam al-Ra’awi at the southwestern entrance to Taiz to inspect the women who come to the city from different areas and provinces. The checkpoint is the only entrance to the besieged city. Abdullah and her friend do not need to take up arms. Their duty is only to check passengers for weapons and suspicious items. They wake up daily by 5 am to prepare breakfast for their families, and then they wear their military jackets and caps and go towards their posts in al-Dhabab area. Abdullah said she is working with Popular Resistance fighters to keep Taiz free from Houthi rebels who killed her brother last year. War erupted in Yemen early in 2015 after Houthi rebels took the capital, Sanaa. A Saudi-led coalition then began a bombing campaign to stop the Houthis, who, allied with former President Ali Abdullah Saleh, are accused of being backed by Iran. While Houthis managed early on to mostly encircle Taiz, Yemen’s third-biggest city, they have been unable to capture it amid opposition from multiple armed factions, collectively known as the Popular Resistance. Abdullah stands at the entrance from 6 am to 6 pm. She does not take any days off, not even on holidays. Four women work at the same checkpoint during the day, and they go home at night. In September 2015, the Popular Resistance in Taiz started to recruit women. Abdullah welcomed the idea and joined the group to avenge her brother. She is a mother of two boys, Ahmed, 8, and Ala’a, 4. Both Abdullah and her husband Omar work with the Resistance and rely on the boys’ grandmother to take care of the children. 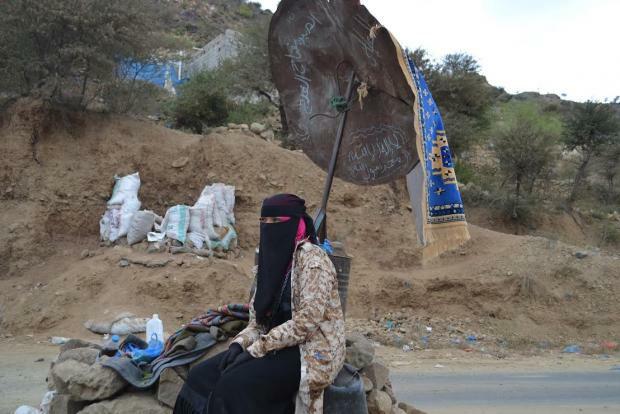 She worked at several checkpoints throughout the city of Taiz, including one in al-Robaie area, near the frontlines. There, she take up arms, as she was expecting an attack by the Houthis at any time. “Now we are working in a safe area, but last year I was in al-Robaie and I carried my Kalashnikov to protect myself,” she said. More than thirty women, including Abdullah and her friend, received training for using machine guns and inspections. Abdullah was a housewife and her husband was a farmer in al-Akhmoor area, 20 km from Taiz city. Now they are both full-time members of the Brigade 17. Abdullah and her husband each get only YR1,000 ($4) a day, she said. Al-Ra’awi, Abdullah’s friend, receives the same amount. She joined the Resistance in July 2016. The leader of the women in the Brigade 17, captain Qaid al-Aliani, said female recruits have several roles in Taiz that men cannot fulfil. He said sometimes Houthi operatives dress up as women to escape areas where the Resistance is closing in. Yemen’s conservative society limits interactions between women and men. The Popular Resistance established a police station operated by women for female suspects. Aliani said the station’s work should continue after the war. Al-Ra’awi’s father, Abdulbaqi, a man with dark, pale skin, sells vegetables to passengers coming into Taiz, about 1 km from where his daughter stands. He said he does not feel ashamed by his daughter’s work. On the contrary, he is proud. He said only female members of the Resistance should search women. Some courageous women, including his daughter, have stepped up to the mission, he added. Not all Taiz residents support the work of women in the Resistance. Some believe that women have to stay at home and only men should fight. Wael Hasan, who lives in Taiz city, said he hates seeing women standing at the checkpoints all day. He said deploying women to checkpoints is provocative behaviour by the Resistance. “I know that sometimes the Resistance needs women to inspect women, but this does not mean that women stay under the sun from early morning until evening. The best place for women is their home,” he told MEE. Hasan accused the Resistance of exploiting the financial needs of women. A Yemeni professor told MEE on condition of anonymity that spreading women at checkpoints is a flawed tactic by the Resistance. However, Abdullah, the female fighter, said other women want to join the Resistance, but the force has enough recruits for now. She denied accusations that women joined the Resistance for the pay.